Confession: it’s been over a year since I entertained the masses with a never-ending list of favorite things (no warm fuzzy kittens, no mittens – I mean, seriously, who can be productive in mittens!) and so I feel quite pleased to present to you a fine piece of street art that is sure to wind up on your list of loves. 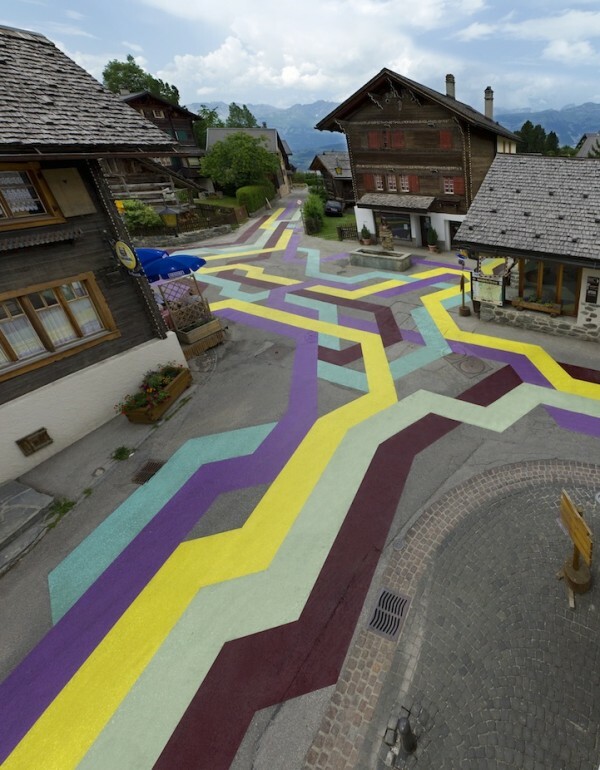 This incredibly simple but powerful painting project in Vercorin, Switzerland encompasses the full width of the village, shooting outwards from the central town square down multiple side streets and alleys. 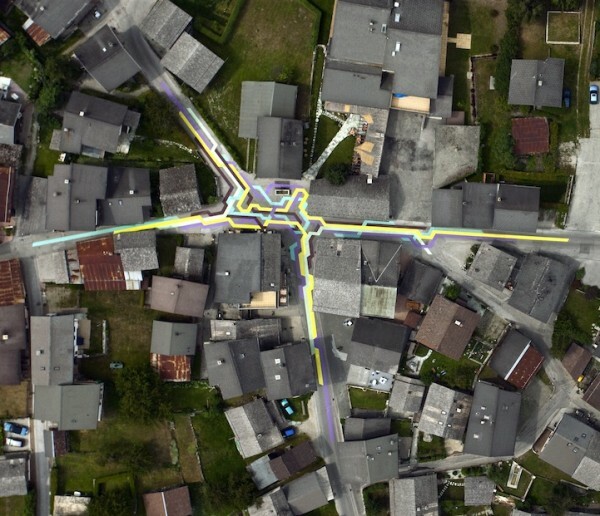 Brightly colored diverging lines thread their way through the town and overlap at several points, creating intertwining forms which contrast with the neat, tidy urban edges. Standing in the middle of the square, the lines seemingly extend out into infinity, while from above–an impossible viewpoint afforded only to birds and passing aircraft–they seemingly form a map for some fictional subway system, albeit one realized on a micro-level where every address, cafe, and town landmark has its own train stop. How fabulous! This tiny hamlet is no stranger to modern art: Every summer the small Swiss town of Vercorin offers up its public spaces and buildings to artists to make do with them what they will. R&Art, the association behind the initiative, commissions contemporary works that seek to engage the village as a whole in an effort to reconcile Vercorin’s history and traditions with contemporary culture. 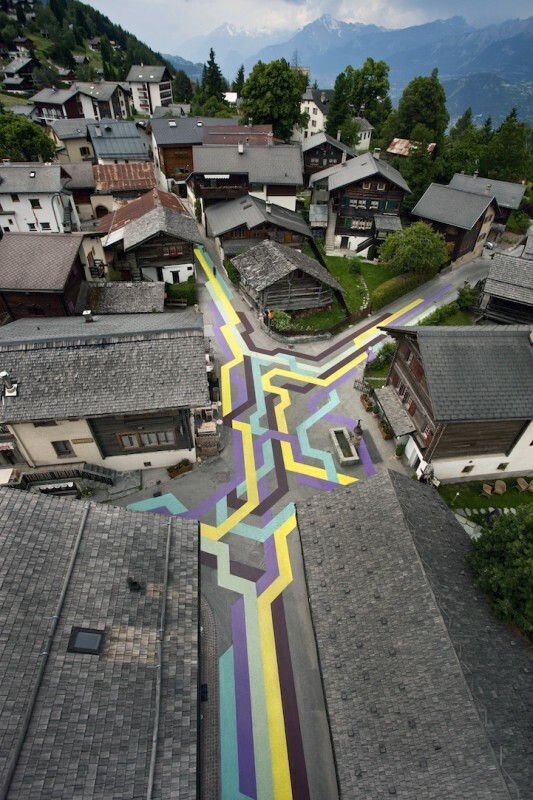 Lang/Baumann‘s “Street Painting #5″ is a stunning testament to the strength of the villagers’ goal to create “spaces for dialogues in synch with our times”. And I say, what better way to demonstrate that the old and the ultra-modern can coincide in peace!? Love it!